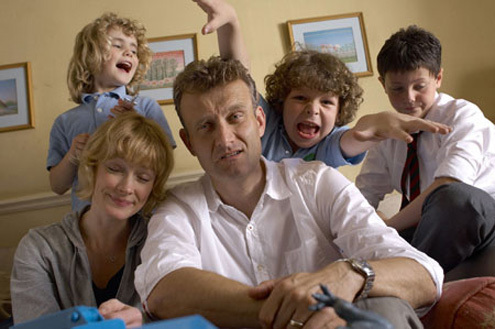 Outnumbered is a successful British Situation Comedy (Sitcom) named so simply because the two parental central protagonists, ‘Sue’ and ‘Pete’ are outnumbered by their three children. It is set in West London and although on the surface offers pluralistic representations in the guise of their unruly children who often intellectually challenge their parents it very much follows a standard genre template established by family based Sitcoms like Butterflies and My Family. There are regular and transitory characters, unseen characters (a common convention) e.g. Sue’s boss in series one and two and familiar, primarily domestic locations. It has received academic criticism for failing to address changing representations in gender and family within society by maintaining conventional representations – they are a nuclear family ( a statistically declining unit) while Pete is a History teacher and Sue is a part time PA, again arguably promoting gender cultural stereotypes. Outnumbered follows on from a historical back catalogue of many successful BBC produced and commissioned Situation Comedies from Fawlty Towers and The Good Life through to Yes Minister, One Foot in the Grave and Keeping Up Appearances through to Only Fools and Horses and the Vicar of Dibley. The list of BBC Sitcoms is endless and for the BBC it has become known as well established, mainstream safe genre programming for over 40 years, cementing their reputation for quality – like Soap Operas Sitcoms require limited production values and are often based on a simple idea that can be easily marketed to target audiences and Outnumbered moves carefully into this equation.